Down 20 lbs and 5 pant sizes! 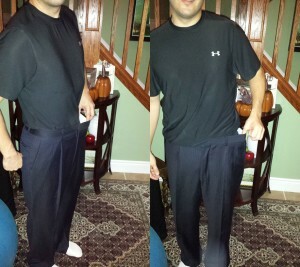 With consistent exercise and good nutrition Bradley has lost 20 lbs and dropped down 5 pant sizes!! 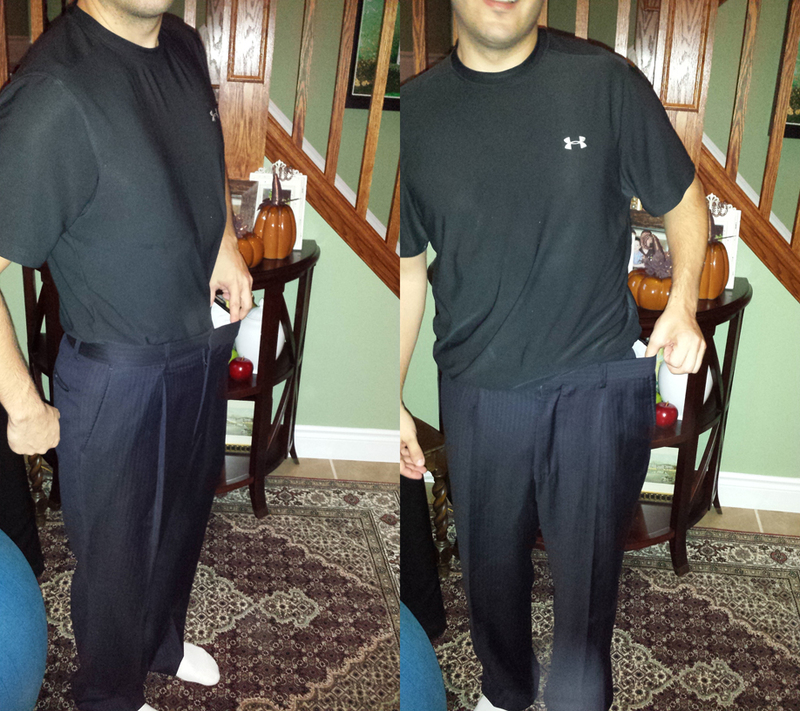 Pictured here are his old dress pants which are now way too big on him and these are even over his workout shorts. His health and energy has increased dramatically. Fantastic job! In just 8 weeks Peter has made an amazing transformation! 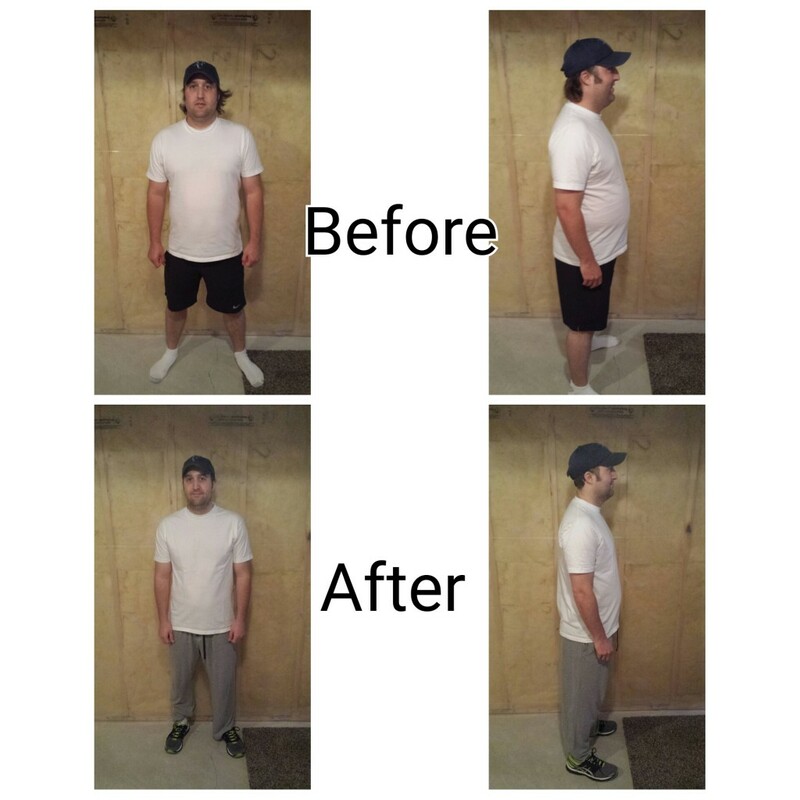 By exercising 3 to 4 times per week, sticking to his Precision Nutrition meal plan and healthy habits he has lost 26.4 lbs and 15.25 inches! You can really tell the difference in the face and midsection. Amazing and great work! 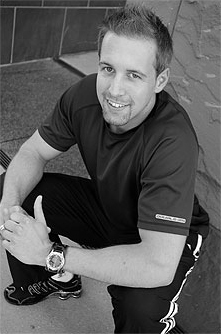 When I first met you and began my workouts, I was sceptical if a personal trainer was right for me. Your approach and manner made me feel very comfortable. You helped me overcome any embarrassment I had. You did a great job of easing me into the workouts and building the intensity as I progressed. It didn’t take long before I saw the results. My energy levels increased and I developed an incredible sense of well-being. I keep being surprised by new exercises and how you continually motivate me. Now, four months later, I’ve lost about 34 pounds and 36+ inches. My life has changed for the better! – Success! Down another 4inches in 6 weeks! That makes a total of 8 3/4 inches in 12 weeks feeling so proud right now! – Outdoor bootcamp was fan-freaking-tastic! Awesome job ladies. Thanks Craig! – Hands down that was the best boot camp class! Thanks Craig for an awesome work out!